This entry was posted on October 4, 2015 at 5:42 am and is filed under Action, Adventure, Science Fiction with tags 2015. You can follow any responses to this entry through the RSS 2.0 feed. You can leave a response, or trackback from your own site. I loved the book and loved the movie. It’s actually a movie about a nice likable person! We’ve certainly had some great and varied movies in space lately! Yes, Matt Damon was very charming. I haven’t liked him this much in a film since probably The Adjustment Bureau. Good review Mark. A way better sci-fi flick than Interstellar and Gravity combined. As much as I hate to say it. There’s room for all 3. I enjoyed Gravity and I enjoyed this. Even Interstellar had its moments, although a distant 3rd. I thought this was tremendous and possibly my favorite of the year so far. 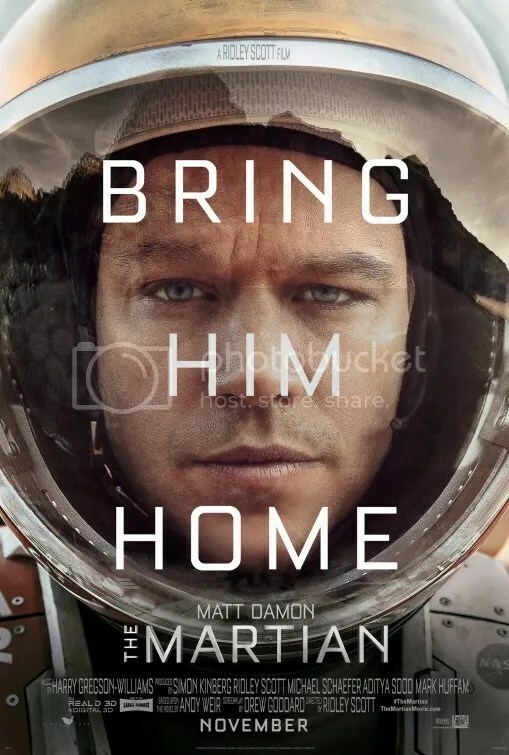 Between the fact that I can finally cheer for Matt Damon again (one of Hollywood’s most overrated actors in my book), and the downright ridiculous size of this story (we pivot back and forth between Earth and Mars and don’t really think twice about it) I have a film that I want to go back and see in theaters again and again. So much fun. It wasn’t deep or anything but yeah the “triumph of the will” spirit of the narrative makes for uplifiting popcorn entertainment. This was definitely a crowd pleaser. It had comedy, great acting and beautiful scenery. The movie was a little long, but I didn’t mind it. I had fun. 4 stars. Yeah there was no reason for this film to be 2 hours 21 minutes. It was good, but that extreme length was a bit indulgent. Both the book and movie were excellent. I didn’t mind the length at all, I thought it was interesting how they fleshed out the characters on earth, as it were. This really had an A-List cast. The earth scenes were interesting. Astrodynamicist, astrophysicist? It can get confusing. It’s not only a tribute to Drew Goddard’s adaptation that the narrative in The Martian can still find humor in the face of grim circumstances, it’s a tribute to the book itself, and Damon as a performer. It does help that Damon is surrounded by so many other great actors who share the burden. You’re right that this film is an unabashed crowd pleaser. I had a blast. Although admittedly as a fan of the book I was a bit disappointed. I felt like the tale lost some of its teeth, mainly in Watney’s sarcasm, which is much stronger in the book, and with some of the awful things that happen to him. Because he has to struggle against so many more bad situations in the book, his stint on Mars felt like a cakewalk in the film. Yeah I was never fearful for his life. Given the circumstances, it was surprisingly lacking in real danger.